It is a tough read and you will probably cry, as I did, It took me many days to read, but the hope is worth it all. And the knowledge. If I can find no other way to help, I can share this knowledge. I am doing better every day. Thank you. Wonderful review, Patti. I will share it and also ask the woman who monitors the One Billion Rising Ithaca website to post it there. ‘In The Body Of The World’ is one of the best books I’ve read in a long time. 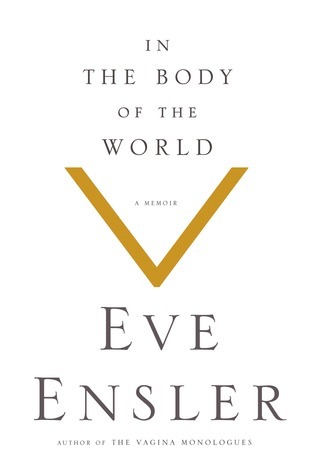 Ensler’s powerful writing style and raw personal honesty help me know the suffering and resiliency of life and of women. If I turn my head away and pretend that suffering doesn’t exist, then I’m helpless in the face of my own losses and struggles, as well as the suffering of others and the earth. I believe Ensler’s power comes from her courage to face what is–and when she sees and knows the truth, she moves to do something on behalf of other women and finally herself. After her personal struggle to digest her horrifying childhood experiences and after being stripped to the bone by cancer, she becomes a shining light of compassionate action. To me it is bravery in its highest form. She has seen and heard and lived through things that I can barely read about, yet, as you say, she turns it into compassionate action. I’m thankful that you told me about the book and that you are spreading the word. Great review Patti. Eve is an amazing woman and I look forward to reading her story in the next week even though I know it will be a difficult read. Thank you, Heather, I am so glad you are going to read it. Call if you want to talk about it. Love you! Thank you, Debby. We met here online, just like you and I. When grief it off.slams me, my word is not so steady, but I do get back up and get moving eventually. Happy to have you “in the loop” now, the book will just top it off. I need to get going on next steps of publishing.